We are dealing in different types of surgical items. We are also dealing in Shaving Blades. 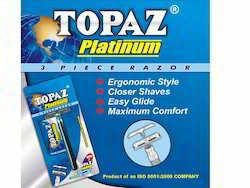 We are presenting an excellent quality assortment of Topaz Shaving Blade. we are offering wide range of Gillette Wilkinson Gillette Shaving Blades. 500mm, 600mm, 800mm, 1000mm, 1300mm, 1500mm, 1800mm, 1600mm and 1850mm. We are authorized distributors of supermax blades. Please contact us for bulk orders and attractive discounts.